What Car Should Star In Its Own Anime Series? Comic books and cartoons are adolescent dreams transposed to color and drama. Japanimation especially takes all the noise and imagination of of pop culture and blasts it to all corners of the globe. 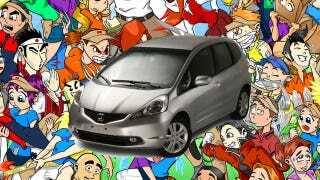 What car would make the perfect supporting character in an anime series? The Honda Fit is a modest little box, but its happy-sci-fi looks and character-hauling room would make it the perfect carrier for a flock of big-haired protagonists on the roll in an electrically charged world. Chase-scene nimbleness doesn't hurt, either. It's as appropriate in Neo-Tokyo as it is in Los Angeles, and we wouldn't be at all surprised if it has a starring role already.